Sierra Leone is on the West Coast of Africa . The Republic of Guinea is to the north and northeast; Liberia is to the east and southeast, and the Atlantic Ocean on the west and south. It has 402km of coastline. From an approximate 100km coastal belt of low-lying land, the country rises to a mountain plateau near the eastern frontier rising 1200m to 2000m with a rich timber forest region. The peninsula, on which the capital and main commercial centre of Freetown stands, is 40km long and 17km wide with a mountainous interior. Sierra Leone celebrated its 50th anniversary of independence from Britain in 2011. Since the end of its civil war in 2002, the government, with considerable international assistance, has made modest improvements in the country's infrastructure which should help the tourism sector: the highway linking Freetown and Bo is now tarred from start to finish and Bumbuna hydroelectric dam supplies electricity when water levels are high enough (both completed in 2009). While the government sector still suffers from chronic shortage of resources, the private sector is booming. Before the Ebola outbreak, the potential for tourism was vast, but largely unrealised. Tourists were starting to return and tour operators were looking closely at what the country had to offer. Sadly, all that has changed. Sierra Leone is rich in natural resources. It has some of the best beaches in the world, a rich colonial heritage, and some stunning scenery, but its greatest asset is its welcoming, friendly populace, most of whom will go out of their way to make a foreigner comfortable. Sierra Leone has a tropical climate, typified by warm temperatures and high humidity. Night time temperatures rarely drop below 24°C and daytime temperatures reach 30°C throughout the year. From October to March, the weather is generally dry with many hot, sunny days. April to September is the rainy season. The rainfall increases to a peak in July and August and then decreases until rain has almost ceased by November. Coastal belt of mangrove swamps, wooded hill country, upland plateau, mountains in east. Electricity is officially 220V, 50Hz. Sockets are British standard. Supplies are unreliable, but improving - parts of Freetown do now get a reasonable supply. The Bumbuna Dam hydro-electric project is now operational (6 November 2009), which provides 50MW of electricity to the capital, which is supplemented by 26MW of thermal power generation. Away from Freetown, mains electricity is only available in Bo and Kenema and comes and goes unpredictably. Makeni, Koidu and Lungi (airport) have new power stations under construction. Please note that Yellow Fever vaccination certificates are required for most nationalities. Proof of vaccination showing the vaccine was provided 10 days prior to arrival might be required to get a visa and is checked at the airport on arrival. Anyone entering Sierra Leone must have a valid passport or travel document. Citizens of Economic Community of West African States (ECOWAS) do not require a visa to enter the country. Citizens of Kenya can obtain a visa on arrival to Sierra Leone. Nationals of Iran issued with diplomatic and service passports can stay a maximum stay of 1 month without a visa. All other nationalities will require a visa, which are issued at Sierra Leone's overseas missions and at the land borders. Visas are not too hard to get; it is unlikely that anyone will be refused unless there is a very good reason for the government not to want them in the country. Visa prices vary considerably based on your citizenship: US citizens need to fork out around US$130 for one, a 3 month visa for UK citizens is £50, German citizens pay €100, while most others can get away with as little as $40. Contact the local embassy for current prices (UK , USA ). In Conakry it is possible to get a one month single entry visa from the embassy located "Route de Donka", near to "Rond point Bellevue" and "Marché de Bellevue". You will need to fill in a form and a copy, bring your passport, a copy of your passport, a copy of the Guinean visa page, a copy of your yellow fever vaccination certificate, a booking confirmation or a letter of invitation, 2 ID pictures and 100USD (its easy to change money near the embassy or in every market of the town). Come early in the morning (9 am), expect to be invited for a detailed interview taking places a few hours later and possibly to get the visa the next day (official maximum being 72h). The process is clean and you will get a receipt for your payment. Tourist visas can easily be extended in Freetown (1 month, twice) for a variable fee (varying with citizenship), prices are on the wall, no "extra fees" and you will get a receipt. The international airport is at Lungi, the other side of the estuary from Freetown. Since 2009 there has been a proliferation of "water taxis," small yacht-like boats that cost around $40, offer free bus connections from the airport terminal, and serve various destinations in Freetown, including Aberdeen, Murray Town, and Kissy. The hovercraft service has resumed operations under the K&K company. It runs from Man of War Bay in Aberdeen. Three often-overloaded car ferries run to the east end of Freetown from Tagrin at the southern tip of Lungi, docking at Kissy Ferry Terminal, which cross the water in 45-70 minutes, but can take several hours including waiting/loading times. For those with a light load, local speedboats (US$1.25) and larger, slower "pampa" boats (USD0.50) are by far the most affordable, if not safest, option. They run fairly frequently, when full, on the same route as the car ferries. The landing in Lungi is wet, but porters wait to carry you in or out of the boats for a small fee (USD0.25). By road it is 5+ hours to the city, via Port Loko using some poor roads. This would probably be the most miserable route, and it's not clear that anyone uses it. There used to be a helicopter service from Lungi which was changed to a charter only service for the mining companies in 2009. New helicopters have been obtained by another company and services are expected to resume late in 2012. Safety concerns have been expressed over all of the different transport options from the airport to Freetown. British Airways is well established, with three direct flights per week to London Heathrow. Air France flies to Paris (via Conakry). Brussels Airlines flies to Brussels. From November 2012, McPhillips Travel have two direct flights from London Gatwick per week. Flights to Nairobi (Kenya Airways), Casablanca (Royal Air Maroc), Accra (ASKY Airlines, Fly540 Ghana, Kenya Airways), Lagos (Arik Air), Banjul (Arik Air, ASKY Airlines, Gambia Bird), Conakry (ASKY Airlines), Monrovia (Royal Air Maroc) and Bamako (ASKY Airlines) are available. Unfortunately, thefts from hold baggage are very common at the airport, especially on the way out of the country. Carry anything of value in your cabin luggage. Luggage is searched with trained dogs on the way in and out, so do not carry any drugs or other illegal substances. Currently Sierra Leone can be accessed by road from Guinea(Conakry) and Liberia. Special permits are required if transiting the border with a private vehicle. From Guinea, bush taxis leave from Conakry to the border at Pamelap where further bush taxis can be taken to Freetown, Makeni, and other cities. Bush taxis from Kindia also go to the border at Médina Oula but transport on the Sierra Leonean side is rare and you will probably have to take a motorbike taxi to Kamakwie. To Liberia, Land Cruiser shared taxis leave early in the morning from Bo and Kenema and take a day to arrive at the border post at Bo (Waterside). The ride is bumpy and passengers are crammed in tightly but there are regular stops to stretch your legs. From Bo (Waterside) shared taxis take around two hours to get to Monrovia. Sierra Leone has the 3rd largest natural harbour in the world and is looking forward to the arrival of cruise ships. Cargo and Passenger ships berth at the Queen Elizabeth II quay, while some passenger/Cargo and private crafts can land at the Government Wharf in central Freetown, arriving most times from Conakry and Banjul. Enquiries should be made to Cargo Shipping Agencies. The road network fell into disrepair during the civil war. However, recently, there has been a substantial reconstruction programme which means the main roads to regional cities such as Bo, Kenema and Makeni are in excellent condition. The road to Kabala mostly smooth tar, with a few terribly potholed patches. The road to Kono is for three quarters tar, but the remaining quart is in mostly poor condition. It means it takes as much time to cover 3/4 of the distance as it takes for the balance 1/4. Government has planned to upgrade the last stretch in 2011. The peninsular road is good from Eastern Freetown clockwise around the peninsular to Tokeh. Work has started on the remaining section to Lumley, but at the end of 2011 remains in very poor condition, with the section between No. 2 Beach and Tokeh being nearly impassable to all but high-clearance 4WD and motorbikes. The roads in Freetown are difficult to characterize. In the center of town, the main roads are mostly smooth and pothole-free, having been constructed from high-quality asphalt a long time ago. Side streets are often a mixture of dirt and gravel, sometimes with large protruding stones, deep crevasses, and other potential dangers. Most main feeder roads such as Wilkinson Road, Spur Road and Sir Samuel Lewis road in the Western part of Freetown are in atrocious condition, but work is under way to reconstruct them - expect traffic chaos until some time in 2012. When walking, always keep your eyes in front of you: most of the sidewalks in Freetown have "death traps," missing blocks of cement that could lead to a nasty fall into an open gutter. 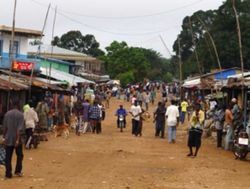 For this reason, most Freetown residents choose to walk in the street and avoid sidewalks, a major contributing factor to the city's congestion. Poda-poda is the Sierra Leonean term for minibuses. The vehicles seem to be stitched together with thread, always nearly at the breaking point, five people for each row of three seats, blaring hip hop turning off and on with application of the gas pedal, never sure whose sweat that is, never sure whether it will make the next hill. They are really cheap, though. Intercity trips cost less than bush taxis (Makeni-Freetown is Le15,000 for instance), and any trip within Freetown from just 1,000. Shared taxis are marginally more comfortable, but still packed to the gills, and only slightly more expensive (Makeni-Freetown Le17,000, Bo-Kenema Le10,000, Port Loko-Lungi Le15,000). Delays, flat tyres and breakdowns are fairly common so leave lots of time especially if you have a flight to catch. The Sea Coach Express boathouse under the bridge between Aberdeen and Murray Town in Freetown is happy to charter the same nice speedboats they use for airport transfers to take you up and down the coast and up the Sierra Leone River. If you have a larger group of people, dropping $300-400 for a daytrip down to the Banana Islands, Bonthe Island, Turtle Islands, or even just some random stretch of long-lost beach could be absolutely worth the cost. Sovereign Ferries [] offers a business class transport service between the airport and city, premium coach transfers from the airport, comfortable air-conditioned terminals and a safe & smooth crossing. Quick and simple online booking allows you to plan ahead or you can purchase tickets on arrival in the airport. Buying your own motorcycle is probably the ideal mode of independent travel. Even the worst roads will be passable in dry season, and you won't have to worry about being transported by careless drivers. Be aware that driving your bike inside the major cities is dangerous due to the crazy traffic, but outside the cities you should be OK as long as you wear a helmet with a visor to protect yourself from dust. English is the official language, but Krio is the lingua franca. Krio is not a pidgin. It is a creole, which means it is a full fledged language with regular grammar and set writing conventions. Unsurprisingly, then, the minority Krios, who mostly live in the Freetown Peninsula take English as a second language, while the Temnes, Mendes, and other groups have their tongues occupied with Krio as their second language. This makes getting around the peninsula pretty easy for English speakers, but the entire rest of the country is more or less Krio-only land. While Krio vocabulary is predominantly from English, it is not intelligible to your average English speaker—although you might be able to follow a little bit if you know some basic vocabulary, when you already know what people are talking about. In the provinces, Mende is the principal vernacular in the south and Temne is the principal vernacular in the north; regular Krio use is mostly limited to provincial cities. The beaches of the Freetown peninsula are spectacular, and on an average day, deserted. There are at least ten that could be described as world-class. Banana Island is easily accessible and offers unsurpassed natural beauty, history, underwater and water activities and vast range of accommodation options. Bonthe Town, on Sherbro Island, is a former British Colonial Town, with several beautiful stone churches, and a rich culture. Tiwai Island (in the middle of a river in SE Sierra Leone) is teeming with rare wildlife. Rural West African villages: experience hospitality and the tranquility of the bush. The Turtle Islands, difficult to get to, but idyllic. The unit of currency is the leone, sometimes symbolised locally as "Le", but internationally and in our guides as SLL. Leone coins have values of SLL50, SLL100 and SLL500. Bank notes are SLL1000, SLL2,000, SLL5,000 and SLL10,000. In May 2010, new bank notes were introduced. The new notes are slightly different in size to the originals and are supposedly more durable. The old SLL500 note has not been replaced. The designs are very similar to the old notes. The new notes far outnumber the old type as of the end of May 2010, so it can be expected that people will not want to accept the old notes for much longer. The old type can be exchanged at banks for one year after the launch date of the new notes. Exchanging money is very easy, either through the black market or banks. The small bank at the airport offers reasonable rates. Pounds sterling, euro or US dollars are most popular, although others are possible. Credit cards are accepted in a few supermarkets, restaurants and hotels (Visa only). The airport duty free shop does take major cards. Some of the other hotels are planning to take cards. It is possible to get money from some banks with a credit card, but the process can be long and rather costly. There are ATMs in Freetown most are not internationally linked. Rokel Commercial Bank has ATMs that accept international Visa cards. As of Nov 2014, there are 4 ATMs in the arrivals area of Lungi airport, all of which seem to accept international debit cards. As much as Sierra Leone is a poor country it will surprise you with the high cost of everything. The lack of a good import system and high import duties plus 15% Goods and Services Tax (GST) mean that many goods are double the price that one would expect to pay in other countries. Foreigners often pay up to ten times the price quoted to locals when it comes to goods you find on the street so you might want to bargain and lower the prices as much as you can. If you are prepared to stay in cheap guest houses (and that means not a safe location with bed bugs in the bed) and travel only by local bus (poda poda) and eat only at street corners (not recommended for your health), you can get by in Freetown on a minimum of around SLL270,000 (about USD65) per day. If you want to eat at a decent restaurant meal every now and then and stay in mid-range accommodation, a more realistic budget is around SLL450,000 (about USD110). If you want to eat and sleep well, you can easily chew through SLL880,000 (about USD220) each day. The main staple of Sierra Leonean food is rice, often accompanied by soup i.e. stews. These stews may include a delicious and often spicy mix of meat, fish, seasonings, greens, etc., often taking hours to prepare. There are plenty of good quality restaurants offering a variety of local and international dishes. During the matching seasons, many fresh fruit are picked, sold and eaten (mangos, bananas, avocados). They also eat seafood particularly in the capital Freetown which is on the Atlantic coast. It is common to go to areas such as Lumley Beach where one can find local fishermen pulling in nets from the Atlantic filled with fish such as crabs, lobsters, oysters, snappers and many, many more. The locals of Sierra Leone eat many plant-based dishes which are rich in fibre, such as cassava leaves, potato leaves, okra, and more. The national brewer, Sierra Leone Breweries Limited, produces the common and cheap Star beer. Guinness extra stout is also brewed locally. Many European beers (Carlsberg, Beck's, Heineken and Cody's) are also imported. Soft drinks such as Coca Cola and Fanta are locally produced. Wine is available from restaurants and supermarkets, but can be expensive. Local brewed palm wine (called "poyo" in Krio), is very popular throughout Sierra Leone. There are some hotels/guesthouses in Freetown. Facilities are very limited in other cities, although improvements are being made. Makeni now has at least one good hotel. There are a few nice, very small, resort-style getaways, notably at Banana Island and Bonthe Island. Overnights in Sierra Leone are quite expensive, and similar to what one might spend in the United States, but with poorer amenities. There are guesthouses to be found in towns of any significant size, usually for USD35-50 for a single room, and will almost always have shared bath/toilet. Average hotels are around USD100-180 for a single room. The cheapest accommodation in SL is found in the villages—ask for the chief (who should speak some Krio, if not any English), and then request a guest house ("guest house" is the right term in Krio, so you will be understood). There is no formal charge associated with the chief's hospitality, but you should "pay him respects" in the morning to the tune of about USD6-8, and then expect to be handing out 10,000 leone notes to the guesthouse caretaker, the water-fetcher, and at least one other person for some random reason. Until March of 2015 there was no single place to view and compare hotels in Sierra Leone. Afrotels now offers the opportunity for guests to view hotels in Sierra Leone, and directly make a reservation via their portal. This is a much needed system that will help guests sort out the current chaotic hotel system in Sierra Leone. Afrotels on its website, states that their guests can review hotels all across Africa, make their selection, and then either pay on the website, or pay directly at the hotel. Sierra Leone is an excellent place to pursue independent research. Possible areas of study are African music, dance, history, politics, as well as zoology, botany, traditional medicine. Krio teachers are easy to find. Unfortunately, the idea of advertising private drum and dance lessons hasn't caught on like it has in other West African countries like Ghana and Senegal, but the possibility exists for those willing to search for a qualified instructor. It's unlikely you'd want to come to Sierra Leone to study at Fourah Bay College or Njala University. These institutions are famous for corrupt practices such as awarding good grades in exchange for monetary payment or sexual favours, and the facilities are generally poor. Most Sierra Leoneans with the financial means aspire to attend university abroad. Many British and American citizens, as well as other Europeans, find short-term volunteer work with international or local NGOs. Finding paid work can be more challenging, but not impossible, especially if you are trained in a field that is lacking qualified locals. Be aware that you may have to pay for an annual work permit, which costs USD1000. Despite the horrific violence of the 90s—or actually, because of it—Sierra Leone is now a very safe country to visit. While petty pick-pocketing, bag-snatching, and other non-violent crimes are a problem in parts of Freetown (and the police are non-responsive), violent crime is extremely rare throughout the country by any international standards, even in the capital. They are many scams revolving around gold or diamond targeting foreigners which have proven very successful, stay away from anyone claiming to be a mine owner or manager. Corruption is less of a problem than it once was, but is still pretty common. There is now an active Sierra-Leone anti-corruption agency, to which you can easily report any bribe request by phone, email, website or in person and it will be taken seriously. Freetown (Lungi) airport has been refurbished and is quite good by African standards. The usual dangers found in undeveloped sub-Saharan Africa, though, are present: traffic and disease. Traffic accidents are far less common than they have any right to be, but be aware that the overcrowded, barely hanging together poda-podas are physics-defying death-traps. Similarly, moto-taxis love speed, with total disregard to the lurking dangers of broken roads, gaping potholes, charging trucks lurking in the dust. There have been a small number of very serious crashes involving buses in remote areas. Walking around the cities at night is hazardous not so much for fear of crime, but rather because the lack of lighting can cause a fall, or a driver might not see you in the road. Locals carry cell phones that have flash-lights, if yours does not, always bring a torch. The dangers associated with tropical disease are basically neither more or less than anywhere else in West Africa, but there are no hospitals anywhere close to Western standards. Malaria is as usual the biggest danger, and any foreign visitor travelling without a mosquito net and anti-malarials is risking their life. During the rainy season, cholera is a frequent problem in much of Sierra Leone. UPDATE: On the 7th of November 2015 the World Health Organization declared Sierra Leone free of Ebola. Water-borne diseases, malaria and other tropical diseases are prevalent. You should consider taking medication to protect against malaria and using insect repellent. Vaccination against yellow fever is now required and against rabies might be recommended. HIV/AIDS is prevalent. 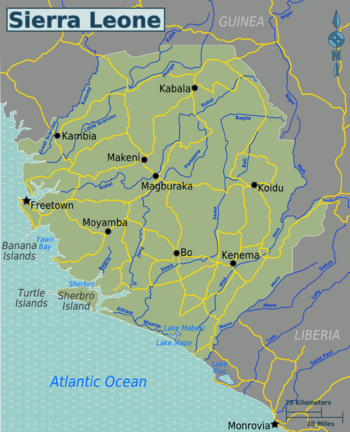 Lassa fever can be contracted in Kenema and the east. In 2010, it has also spread to the North, resulting in 48 deaths between the start of the year and November. If you have travelled in these regions you should seek urgent medical advice for any fever not positively identified as malaria. Medical facilities are very poor. You should carry basic medical supplies. You should take medical advice before travelling and ensure that all appropriate vaccinations are up to date. Drink only bottled water and be aware of what you eat and how well cooked it is. The country code is 232. Sierra Leone has fixed line phone service in Freetown, Bo and Kenema. The mobile phone network uses the GSM technology (as in Europe) and use is widespread. The format for dialling is: +232-##-######, where the first "##" designates the area code. Key area codes include Freetown (22) and Bo (32). Calls to mobile phones use the operator's area codes: (77/88/30) for Africell, (76/78) for Airtel (Celtel/Zain) and (33) for Comium. Tigo was bought by Africell in late 2009, and their 30 prefix was incorporated into the Africell network. Like other countries, when dialling locally, "00" is used to access an international number (and followed by the country code) and "0" is used to access a national number (followed by the area code). The major cities and industrial areas enjoy good coverage as well as some major national roads. Airtel is the oldest and has the best nationwide coverage. International roaming is available. International calling is relatively cheap. Some of the mobile networks charge as little as $0.35/minute to all countries with some countries costing just $0.15 per minute. Airtel Sierra Leone is part of the One Network Service. This allows an Airtel SIM card from another country to be used in Sierra Leone. Incoming calls are free to receive and local calls are charged at local rates. Remember that calls to the SIM cards home country will be charged at international rates. Sierra Leone now uses 112 for emergency calls from any phone network. Calls are free and will be directed to the relevant emergency service. Internet access has improved immeasurably since the activation of the ACE submarine cable in 2013. The major hotels in Freetown usually have wireless networks. All the Internet Service Providers have installed wireless networks that cover Freetown, but the provincial towns are underserved and mostly rely on VSAT satellite services. VSAT services are provided by Onlime (http://www.onlime.sl) with support in country. Africell and Airtel offer a GPRS/3G service which work reasonably in urban areas, but patchily outside major conurbations. USB modem wireless internet is also available from Africell, Airtel, Comium and Sierratel. Fixed internet service is available from Onlime (http://www.onlime.sl), Afcom, LimeLine (http://www.limeline.sl), Speednet, and IPTEL. This page was last edited on 24 September 2018, at 03:55.